CQPweb is a web-based graphical user interface (GUI) for some elements of the CWB – and in particular, the CQP query processor. CQPweb is designed to replicate the user-interface of the popular BNCweb tool, which also (in its most recent versions) uses CQP as a back-end. Like BNCweb, CQPweb uses a database alongside the CWB to provide extra functions beyond those built into CWB/CQP. However, unlike BNCweb, CQPweb can be used with any corpus. [More] screenshots of CQPweb can be downloaded from this link. This entry was posted in CQPweb, cwb, Support, Tutorials on May 25, 2015 by Markus Killer. This entry was posted in AntConc, CQPweb, SketchEngine on May 14, 2015 by Markus Killer. 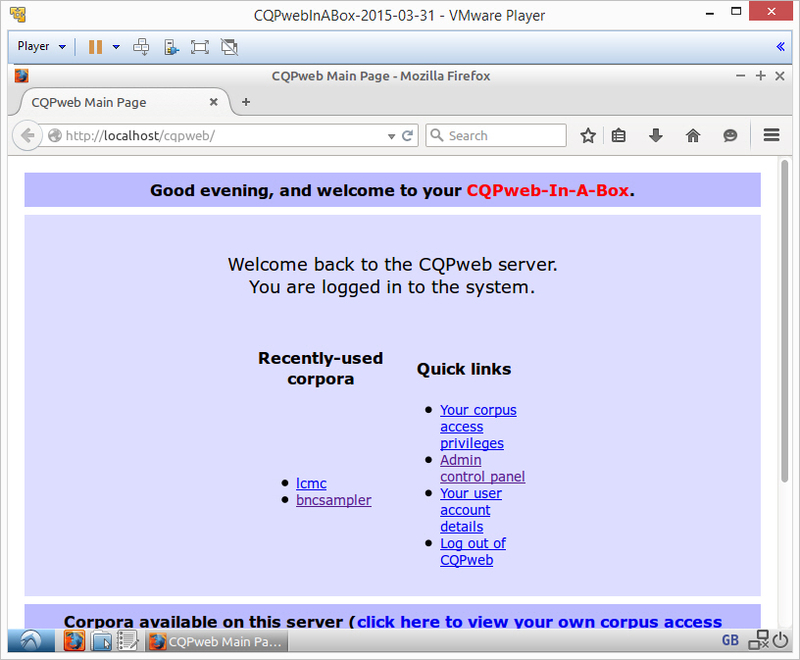 > – a virtual machine image containing a pre-installed copy of CQPweb. > all the different components. > Then “import appliance” from the .ova download. > don’t fear the Linux! > I will create some video tutorials & put them on YouTube as soon as I can. This entry was posted in CQPweb, cwb, Featured tools on April 9, 2015 by Markus Killer. This entry was posted in CQPweb, Featured tools, Tools on February 5, 2014 by Markus Killer.